Harvestman skin (Dicranopalpus ramosus). 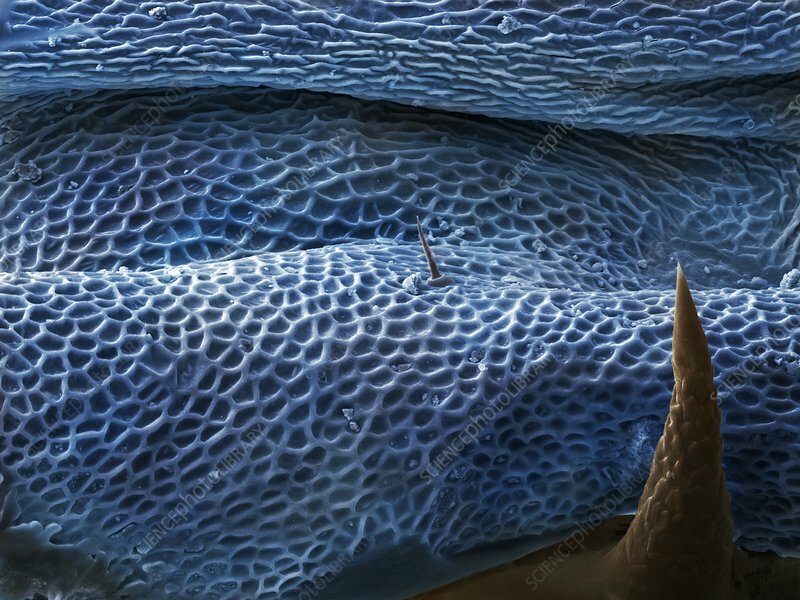 Scanning electron micrograph of the skin of a harvestman's abdomen. This harvestman is long-legged and has a very characteristic position when at rest making it a species easy to identify. It prefers to rest flattened onto walls or fences with it's legs outstretched. Originally absent from Europe, Dicranopalpus ramosus was first reported in Bournemouth in 1957. Harvestman differ from spiders by having only one pair of eyes on a centrally positioned ocularium, they do not have venom glands or hollow fangs and are devoid of silk glands. The pedipalps are generally less complicated than spiders and are believed to be tactile sensory organs. Unlike spiders, there are small differences between the sexes which are shown on the pedipalps. This specimen is a female. Magnification x1500 (x375 at 10cm wide).